Seagate is celebrating the shipment of its one billionth disk drive after 29 years in biz. The storage giant reckons it will reach its second billion in less than five-years' time. Seagate said it's shipped the equivalent of 79 million terabytes of storage since the company made its first hard drive in 1979. 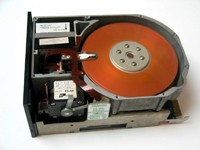 Its debut product, the ST506 hard drive, had a 5MB capacity, weighed about five pounds, and cost $1,500 (£757). Today, Seagate sells 1TB drives for under a third of that price. The company figures its next 1,000,000,000 drives will go down easier based on the ever-increasing demand for storage. Gartner Group last year estimated more than 500 million drives were shipped worldwide, compared to about 30 million in 1990.